3. High-rise buildings can be built cheaper as a steel frame than any other method. Steel frame construction is basically done with the type of steel which is called Mild Steel. Steel framing can hold more weight. Mild steel is very strong, this provides amazing strength to the buildings. 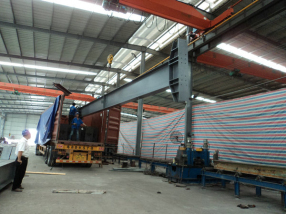 Steel framing is very flexible, the bar can be bend without breaking it. The greatest advantage of steel frames is they not collapse immediately, they will bend out of shape, which is warning to inhabitants to escape. One more benefit of steel frames is in earthquake they will not collapse like other materials. Number of steel bars are used to make buildings this is why they have been called steel-frame construction. Steel frames construction is the one on which you can trust, it means this type of building will be more reliable and quiet safe to live in or wok in. Steel framework is used in warehouses, offices and residential buildings. The framework created for these buildings is strong and can be set up quickly because manufacturing creates the building frame as a series of interlocking materials. A frame takes lateral forces, like wind blowing against the wall, and drives them into the foundation. The steel roof deck above behaves like a diaphragm and carries the wind loads from one wall to another that is perpendicular to it.